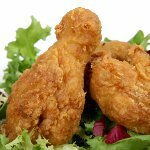 Fried chicken, also known as Southern fried chicken, can be considered a type of fritters. The tradition of deep frying chicken in fat was brought to the Southern United States by Scottish immigrants. Over time, fried chicken became a common staple of the American South.